For 2017, the DAVID BOWIE Is exhibition visits Tokyo, then Barcelona and New York. Currently open at the Museo d'Arte Moderna di Bologna, Italy (MAMbo) until 13th November, the retrospective will travel to Tokyo before going to Barcelona, its last European venue before its opening in New York. BARCELONA: Museu del Disseny de Barcelona (The Design Museum), Pl. de les Glòries Catalanes, 37-38 08018 Barcelona, Spain - More details. NEW YORK: (Venue and dates to be announced). In an emotional account of working with David Bowie, his curator Beth Greenacre (2000-present) describes the connections in his private collection. From Camden Town to St. Ives, via German Expressionism and Ziggy Stardust. David Bowie took a hands-on approach to collecting art, explains his curator Kate Chertavian (1992-2000). Looking back at their time together, Chertavian reveals the intensity, curiosity and fascination Bowie brought to his other 'full-time job'. In his 1998 novel, author William Boyd created a fictional abstract expressionist painter named Nat Tate, and fooled the art world with a little help from his Modern Painters magazine colleague David Bowie. Art critic and author Matthew Collings first met David Bowie in 1997 when Bowie was the publisher of his book. Struck by the late icon's artistic passion, Collings reflects on the works comprising Bowie/Collector to be offered at Sotheby's. New Zealand (Outside Top 40 but #4 Heatseeker - fastest rising). The album was released on Friday 21st October and is available on 2-CD and Vinyl 3-LP formats via ISO/Columbia/RCA Records, also included in this release are three David Bowie studio recordings 'No Plan', 'Killing A Little Time' and 'When I Met You'. THE COMPLETE DAVID BOWIE 2016 EDITION OUT NOW! 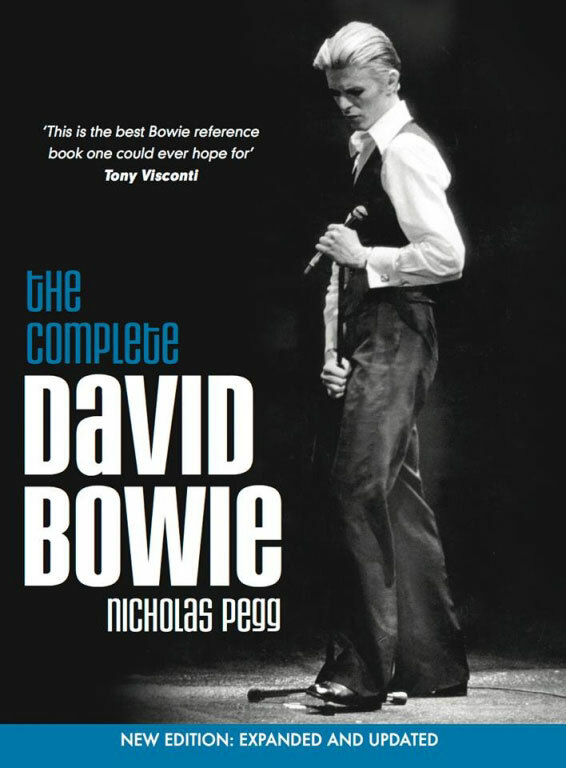 Published today is the 2016 newly revised and expanded Seventh Edition of THE COMPLETE DAVID BOWIE by NICHOLAS PEGG via Titan Books. Incorporating 'Blackstar', 'The Next Day', the 'David Bowie Is' exhibition, the 'Lazarus' stage show, this year's heartbreaking news, and every other development in the world of David Bowie since the last update was published back in 2011, this new edition will be the biggest one yet. For USA... owing to distribution schedules and other logistics, the US publication date has been confirmed as 29th November. "This is the best Bowie reference book one could ever hope for" - TONY VISCONTI. You can purchase The Complete David Bowie revised and updated 7th edition 2016 NOW! The Australian: David Bowie's last song, 'Blaze', shows he was optimistic until end - [Read here]. The Irish Mirror: David Bowie's last ever song is discovered months after his death - [Read here]. 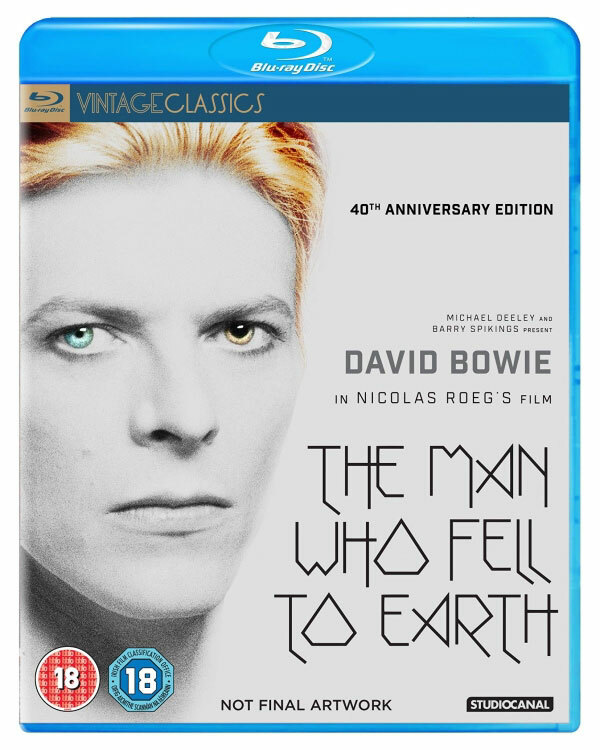 Now released is THE MAN WHO FELL TO EARTH 40th Anniversary Collectors' Edition Blu-ray 2016 from StudioCanal. Nicolas Roeg's iconic science fiction odyssey, has been stunningly restored in 4k to mark the 40th anniversary of this cult classic. This Collectors' Edition contains 4 DISCS, an exclusive bonus John Philips CD, booklet, x 4 artcards, original press book and an A4 poster of the new theatrical quad. Featuring a startling and era defining lead performance from DAVID BOWIE in his debut feature role and based on the cult novel by Walter Tevis. The Man Who Fell To Earth endures as, not only a bitingly caustic indictment of the modern world but, also, a poignant commentary on the loneliness of the outsider. Actors: David Bowie, Rip Torn, Candy Clark, Buck Henry, Bernie Casey. Producers: Michael Deeley, Barry Spikings. DVD Release Date: 24th October 2016. - New interview with costume designer May Routh featuring original costume sketches. - New interview with stills photographer David James featuring behind the scenes stills. - New interview with fan Sam Taylor-Johnson. - New interview with producer Michael Deeley. - New 'The Lost Soundtracks' featurette. - Interview with Candy Clark. - Interview with writer Paul Mayersberg. - Interview with cinematographer Tony Richmond. - Interview with Nic Roeg. - Trailers / TV spots. - Watching the Alien featurette. - Exclusive bonus John Philips CD. - A4 poster of new theatrical quad. 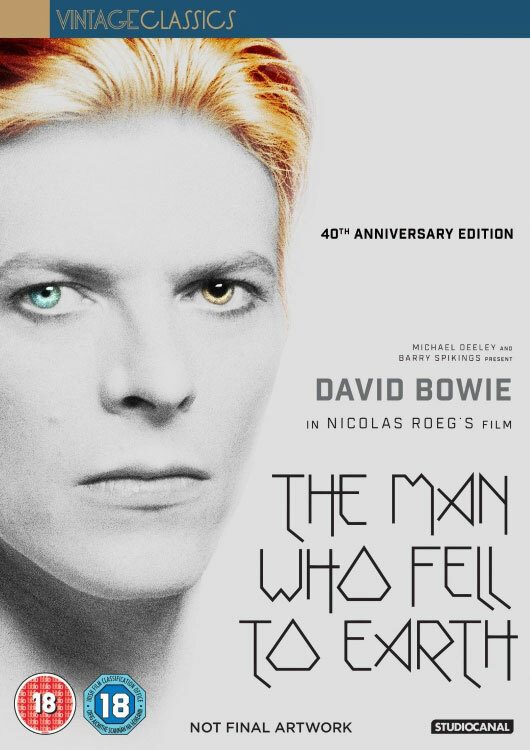 You can purchase The Man Who Fell To Earth 40th Anniversary Collectors' Edition 2016 NOW! 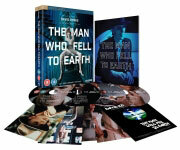 Also relesed today is THE MAN WHO FELL TO EARTH 40th Anniversary Blu-ray and DVD 2016 from StudioCanal. Check out the promotional film for the forthcoming DAVID BOWIE collectors' book SHOOTING-UP PIE-IN-THE-SKY by IVOR JONES. Shooting-Up Pie-In-The-Sky from Ivor Jones on Vimeo. For more details and information, as and when it becomes available, visit the Facebook page. Are you up for a bit of writing about DAVID BOWIE? Written submissions are required for a forthcoming book with profits going to charity. Be a part of a collection of Bowie stories - written entirely by his fans - that span all decades of his work! In the months since David's untimely death, there have been bits and pieces of your favorite memories surfacing - this book will bring together all those wonderful stories! Your submission can be from any decade as long as it is heartfelt and entertaining. The compilation will be edited and published by Dale K. Perry, a writer and longtime Bowie enthusiast. Story submissions: Please submit your story no later than 1st December 2016. Make sure the year and location of the event you are writing about is included. If you wish to include photographs, they must be your own personal photos not copyrighted professional pictures. Please suggest a title for your piece. Assistance with writing and/or editing is available. Your submission should be true - this is not a work of fiction. If your narrative is accepted for use you will receive contributor credit (or you may remain anonymous if you prefer). For information on how to submit using regular snail mail, please email the above address. 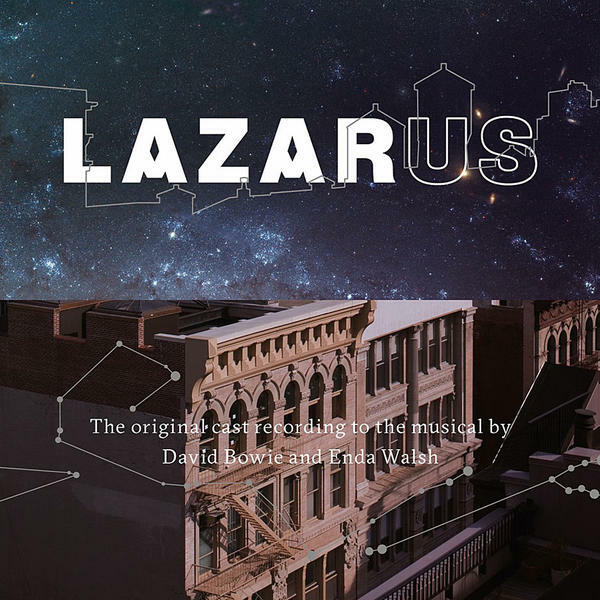 All three songs are released this Friday (21st) and feature on a separate disc of the original cast recording of the LAZARUS musical written by David Bowie and ENDA WALSH. You can purchase both the 3LP Vinyl and the Double CD NOW! Update: Two of the three unheard studio DAVID BOWIE songs get their public worldwide airing today. Earlier this morning, if you missed the first airing of 'When I Met You' played this morning on Shaun Keaveny's BBC RADIO 6 MUSIC show go here and fast forward to 51:20 to listen. Also on BBC RADIO 2 during the Jeremy Vine show from midday, he will be playing 'No Plan'. If you can listen in here fast-forward to 45:42. Both songs, plus 'Killing A Little Time' will released this Friday (21st) feature on the original cast recording of the LAZARUS musical written by David Bowie and ENDA WALSH. The 2016 newly revised and updated Seventh Edition of THE COMPLETE DAVID BOWIE by NICHOLAS PEGG is to be published via Titan Books this month on Tuesday 25th October. Join Titan Books and Nicholas Pegg for the launch of THE COMPLETE DAVID BOWIE (Revised and Updated 2016 Edition). Featuring over 70,000 words of new material, Nicholas Pegg's critically acclaimed The Complete David Bowie has been fully revised and updated, offering Bowie fans the most up-to-date encyclopedia of songs, albums, tours, films and videos ever published, from Liza Jane to Blackstar and all points in between. Nicholas Pegg will be signing early release copies of The Complete David Bowie on Saturday 22nd October at THE ROYAL GEORGE TAVERN from 2pm - 8pm, with a soundtrack of some of the late star's greatest hits and lesser known classics offering a celebration of Bowie's untouchable legacy. Time: 2 - 8pm - (Bar open till late). Copies of the book will be available to purchase at the event. Venue: Downstairs Bar at The Royal George Tavern. Address: 133 Charing Cross Rd, London WC2H 0EA. Directions: Nearest tube: Tottenham Court Road - take exit 4 and turn right past Centre Point and then turn right by Starbucks into Gosslett Yard (under 3 minutes walk). Nearest train station: Charing Cross (10 minutes walk). If you can't make the event, you can pre-order The Complete David Bowie revised and updated 7th edition 2016 NOW! A photographic exhibition by DANIELE PENSAVALLE entitled: 'REALITY TOUR IN ITALY - the last stage of a Fantastic Voyage' is now open from Friday 14th October through to Sunday 13th November at Cortile Cafe, Via Nazario Sauro, 24/A, Bologna, Italy. More details and information can be found on the Facebook events page and at David Bowie Blackstar website. DONNY McCASLIN who as you know collaborated with DAVID BOWIE on his ★ album has released a brand new album today entitled: BEYOND NOW . Beyond Now features the same group of musicians that defined Blackstar's aesthetic - keyboardist Jason Lindner, bassist Tim Lefebvre and Mark Guiliana. Donny says: "There was a lot of that energy bouncing off of all of us when we were recording Blackstar and I wanted to make sure that that was all present in this new record. 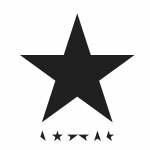 "The title track 'Beyond Now' is directly inspired by a song of David's that we recorded during the Blackstar sessions, but that didn't make the final record. All the originals were written last summer - before he passed away, but while the Blackstar recordings were still really fresh. [The sessions concluded in Spring 2015.] Songs of his were just kind of running through my unconscious. That was part of it." Also featured on the album are two Bowie cover versions: 'A Small Plot Of Land' (David Bowie/Brian Eno/Reeves Gabrels/Mike Garson/Erdal Kizilcay/Sterling Campbell) and 'Warszawa' (David Bowie/Brian Eno). 2. A Small Plot Of Land. Featured in the linear notes is a wonderful written tribute to David Bowie and everyone who loved him. The album is available to purchase NOW. Check out the official trailer for the album below.. If you've never seen 'CAMILLA' the award-winning short film directed by SAMIA SHOAIB from 1995, you should really check it out. This experimental 16mm film explores the workings of memory. A visually stunning short film shot in lush black and white about a young woman coping with the end of a relationship in the aftermath of a termination. Inspired by the William Wordsworth quote: "The Child is father of the Man". Actress, filmmaker and writer Samia makes wonderful use of several DAVID BOWIE songs on the soundtrack. You can view all the lots and the THREE online catalogues for the upcoming BOWIE/COLLECTOR art sale at Sotheby's in London. Bowie/Collector - Part I: Modern and Contemporary Art - Evening Auction. 10th November 2016 at 7.00pm GMT - London. Bowie/Collector - Part II: Modern and Contemporary Art - Day Auction. 11th November 2016 at 10.30am GMT - London. Bowie/Collector - Part III: Design: Ettore Sottsass and the Memphis Group. 11th November 2016 at 4.00pm GMT - London. For more details and information, please visit sothebys.com website. 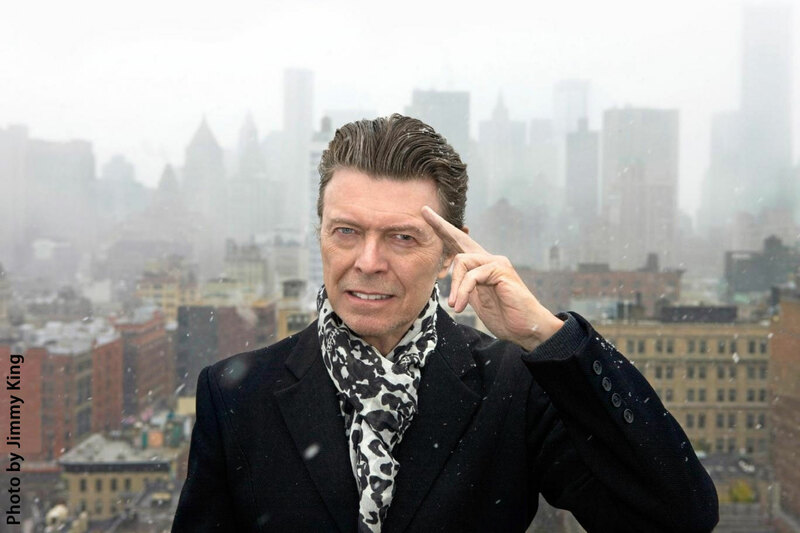 Check out a wonderful and touching piece DAVID BOWIE 'Sunday' tribute mix by Sébastian Bédé. This unofficial version of 'Sunday', taken from the album 'Heathen' (2002) features David Bowie's original vocal. Sébastian revisited 'Sunday' as a tribute to the huge David Bowie influence on his work. He played Omnichord, Minimoog Voyager, Mellotron, Stylophone... instruments he says he wouldn't know without David Bowie. Taking place on Friday 21st October is the STAND UP TO CANCER charity TV event on CHANNEL FOUR which starts at 7.00 pm. Davina McCall, Alan Carr and Adam Hills are to host this incredible night of live television, with a wealth of famous faces coming together to help fight cancer by raising a tonne of cash. During the event, BOY GEORGE and a very special choir will pay tribute to DAVID BOWIE. Please visit the channel4.com website for more details and information. Tickets are now on sale for the Japanese DAVID BOWIE IS exhibition in Tokyo. The exhibition is to be held at Warehouse Terrada G1 Building and opens on Sunday 8th January until Sunday 9th April 2017. Venue: Warehouse TERRADA G1 Building. Address: 2-6-10, Higashi-Shinagawa, Shinagawa-ku, Tokyo, Japan. 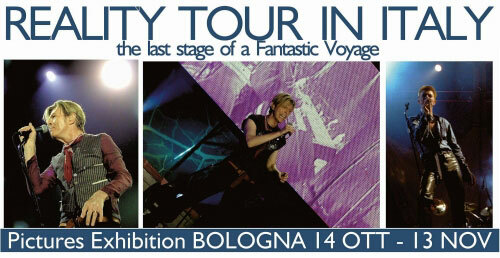 For more details and purchasing tickets, please visit the davidbowieis.jp website. The 2016 newly revised and expanded Seventh Edition of THE COMPLETE DAVID BOWIE by NICHOLAS PEGG is to be published via Titan Books this month on Tuesday 25th October. Incorporating 'The Next Day', 'Blackstar', the 'David Bowie Is' exhibition, the 'Lazarus' stage show, this year's heartbreaking news, and every other development in the world of David Bowie since the last update was published back in 2011, this new edition will be the biggest one yet. I'm told this new edition contains over 600,000 words (to be precise it's 601,946) and it is now officially longer than War And Peace! You can pre-order The Complete David Bowie revised and updated 7th edition 2016 NOW! Released later this month is the original cast recording of the LAZARUS musical written by DAVID BOWIE and ENDA WALSH on Friday 21st October. Available on 2-CD and vinyl formats via ISO/Columbia/RCA Records, also included in this release are three David Bowie studio recordings 'No Plan', 'Killing A Little Time' and 'When I Met You'. Co-produced with Tony Visconti and recorded with Donny McCaslin and his quartet, these 3 songs feature the same musicians that played on the ★ album. The album artwork has been designed by Jonathan Barnbrook, who also worked with Bowie on his ★, Nothing Has Changed, The Next Day and Heathen albums. The Lazarus cast album was produced by the show's musical director Henry Hey, who had previously worked with Bowie on 'The Next Day' and features vocals from Michael C. Hall, Sophia Anne Caruso, Cristin Milioti, Michael Esper and other cast members backed by the seven-piece house band Hey assembled for the New York run. The cast album was recorded on 11th January 2016. Upon arriving at the studio, the musicians and cast were shocked and saddened to learn that David had passed away the evening before. Their emotional performances that day are captured on this recording. 01. Hello Mary Lou (Goodbye Heart) - Ricky Nelson. 02. Lazarus - Michael C. Hall & original NY cast of Lazarus. 03. It's No Game - Michael C. Hall, Lynn Craig & original NY cast of Lazarus. 04. This Is Not America - Sophia Anne Caruso & original NY cast of Lazarus. 05. The Man Who Sold The World - Charlie Pollock. 06. No Plan - Sophia Anne Caruso. 07. Love Is Lost - Michael Esper & original NY cast of Lazarus. 08. Changes - Cristin Milioti & original NY cast of Lazarus. 09. Where Are We Now? - Michael C. Hall & original NY cast of Lazarus. 10. Absolute Beginners - Michael C. Hall, Cristin Milioti, Michael Esper, Sophia Anne Caruso, Krystina Alabado & original NY cast of Lazarus. 11. Dirty Boys - Michael Esper. 12. Killing A Little Time - Michael C. Hall. 13. Life On Mars? - Sophia Anne Caruso. 14. All The Young Dudes - Nicholas Christopher, Lynn Craig, Michael Esper, Sophia Anne Caruso & original NY cast of Lazarus. 15. Sound And Vision - David Bowie. 16. Always Crashing In The Same Car - Cristin Milioti. 17. Valentine's Day - Michael Esper & original NY cast of Lazarus. 18. When I Met You - Michael C. Hall & Krystina Alabado. 19. "Heroes" - 4:43 - Michael C. Hall, Sophia Anne Caruso & original NY cast of Lazarus. 01. Lazarus - David Bowie. 02. No Plan - David Bowie. 03. Killing A Little Time - David Bowie. 04. When I Met You - David Bowie. 01. No Plan - Sophia Anne Caruso. 02. Love Is Lost - Michael Esper & original NY cast of Lazarus. 03. Changes - Cristin Milioti & original NY cast of Lazarus. 04. Where Are We Now? - Michael C. Hall & original NY cast of Lazarus. 01. Absolute Beginners - Michael C. Hall, Cristin Milioti, Michael Esper, Sophia Anne Caruso, Krystina Alabado & original NY cast of Lazarus. 02. Dirty Boys - Michael Esper. 03. Killing A Little Time - Michael C. Hall. 04. Life On Mars? - Sophia Anne Caruso. 05. All The Young Dudes - Nicholas Christopher, Lynn Craig, Michael Esper, Sophia Anne Caruso & original NY cast of Lazarus. 01. Sound And Vision - David Bowie. 02. Always Crashing In The Same Car - Cristin Milioti. 03. Valentine's Day - Michael Esper & original NY cast of Lazarus. 04. When I Met You - Michael C. Hall & Krystina Alabado. 05. "Heroes" - Michael C. Hall, Sophia Anne Caruso & original NY cast of Lazarus. You can pre-order both the 3LP Vinyl and the Double CD NOW! 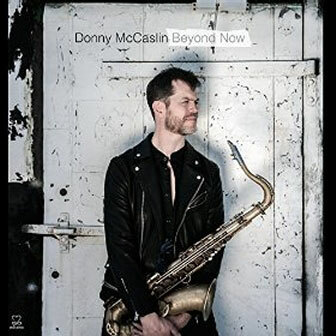 DONNY McCASLIN who as you know collaborated with DAVID BOWIE on his ★ album is to release a new album this month entitled: BEYOND NOW scheduled for 14th October. You can purchase A Small Plot Of Land and can now listen to MP3 samples here of each track. WOODY WOODMANSEY is reading from his autobiography at The Olympia Shehnai, 75-77 London Street, Reading RG1 4QA, England on Saturday 29th October. Tickets only £5. Book now via readingarts.com website. Woody's book entitled Spider from Mars: My Life with Bowie is published nex month on 3rd November by Sidgwick and Jackson; (Main Market Ed. edition). This 320-page, hardcover is a poignant memoir by the last surviving member of DAVID BOWIE's The Spiders from Mars band. 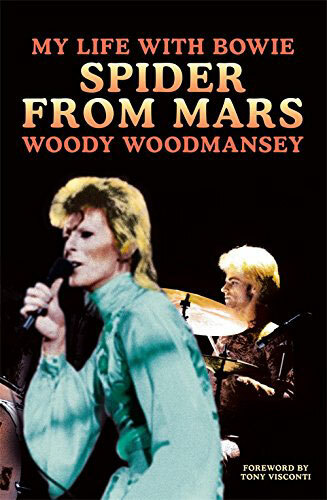 About the Author: Woody Woodmansey was the drummer in the Spiders From Mars, and played on six of Bowie's albums:The Man Who Sold The World, Hunky Dory and The Rise and Fall of Ziggy Stardust and The Spiders From Mars, Aladdin Sane and two live albums, Ziggy Stardust - The Motion Picture and Santa Monica '72. He currently leads the super group Holy Holy, who tour and perform David Bowie songs from he 1970s. You can pre-order Spider from Mars: My Life with Bowie NOW. Released this month on Monday 24th October is THE MAN WHO FELL TO EARTH 40th Anniversary Collectors' Edition Blu-ray 2016 from StudioCanal. You can pre-order The Man Who Fell To Earth 40th Anniversary Collectors' Edition 2016 NOW! 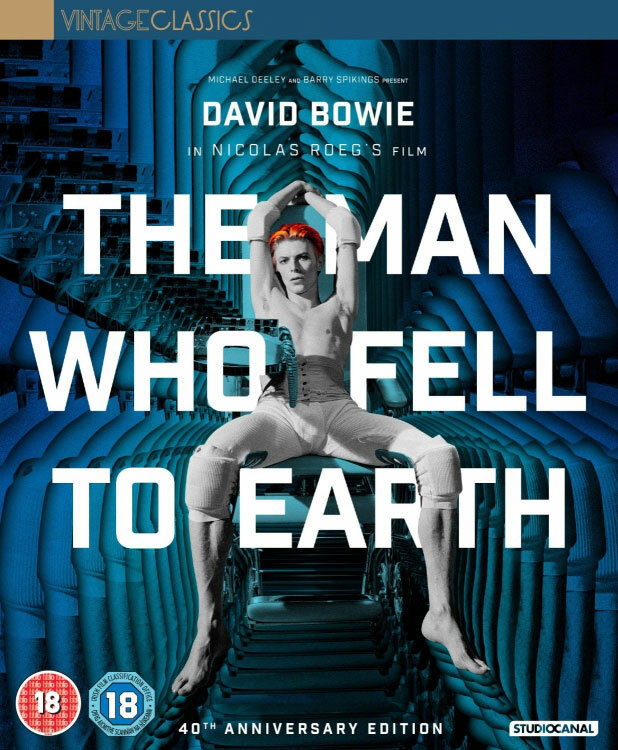 Released this month on 24th October is THE MAN WHO FELL TO EARTH 40th Anniversary Blu-ray and DVD 2016 from StudioCanal. You can pre-order both The Man Who Fell To Earth 40th Anniversary on Blu-ray and DVD NOW! 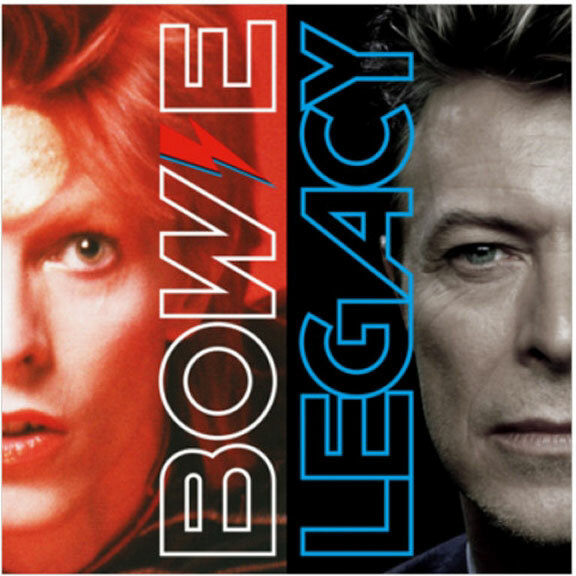 A brand new DAVID BOWIE compilation album entitled: BOWIE - LEGACY is set for release next month on Friday 11th November. This album collects together a selection of David Bowie's most popular tracks and singles, from 1969's 'Space Oddity', through to the final singles 'Lazarus' and 'I Can't Give Everything Away', issued earlier this year. Available on CD and 2-CD Deluxe formats and MP3 digital , with the double 2-LP Vinyl edition released on 7th January. All formats will include a previously unreleased version of 'Life On Mars?' newly mixed by Ken Scott. 01. Let's Dance (single version) (4.08). 02. Ashes To Ashes (single version) (3.35). 03. Under Pressure - Queen and David Bowie (4.04). 04. Life On Mars? (2016 mix) (3.37). 06. Oh! You Pretty Things (3.11). 07. The Man Who Sold The World (3.58). 09. Starman (original single mix) (4.12). 11. The Jean Genie (original single mix) (4.05). 13. Golden Years (single version) (3.27). 14. Dancing In The Street - David Bowie and Mick Jagger (3.11). 15. China Girl (single version) (4.15). 17. Sound And Vision (3.03). 18. "Heroes" (single version) (3.33). 19. Where Are We Now? (4.09). 20. Lazarus (radio edit) (4.05). 02. The Man Who Sold The World (3.58). 04. Oh! You Pretty Things (3.11). 05. Life On Mars? (2016 mix) (3.37). 06. Starman (original single mix) (4.12). 09. The Jean Genie (original single mix) (4.05). 10. All The Young Dudes (3.09). 14. Young Americans (original single edit) (3.14). 16. Golden Years (single version) (3.27). 19. Boys Keep Swinging (3.17). 20. Ashes To Ashes (single version) (3.35). 21. Fashion (single version) (3.25). 01. Under Pressure - Queen and David Bowie (4.04). 02. Let's Dance (single version) (4.08). 03. China Girl (single version) (4.15). 04. Modern Love (single version) (3.56). 06. This Is Not America - with The Pat Metheny Group (3.51). 07. Dancing In The Street - David Bowie and Mick Jagger (3.11). 08. Absolute Beginners (edit) (4.46). 09. Jump They Say (radio edit) (3.53). 10. Hallo Spaceboy (PSB Remix) - with The Pet Shop Boys (4.23). 11. Little Wonder (edit) (3.40). 12. I'm Afraid Of Americans (V1 edit) (4.25). 13. Thursday's Child (radio edit) (4.25). 14. Slow Burn (radio edit) (3.57). 15. Everyone Says 'Hi' (edit) (3.29). 16. New Killer Star (radio edit) (3.42). 17. Where Are We Now? (4.09). 18. Lazarus (radio edit) (4.05). 19. I Can't Give Everything Away (radio edit) (4.25). 01. Oh! You Pretty Things (3.11). 04. Starman (original single mix) (4.12). 01. The Jean Genie (original single mix) (4.05). 03. Golden Years (single version) (3.27). 04. Dancing In The Street - David Bowie and Mick Jagger (3.11). 05. China Girl (single version) (4.15). 02. Sound And Vision (3.03). 03. "Heroes" (single version) (3.33). 04. Where Are We Now? (4.09). 05. Lazarus (radio edit) (4.05). 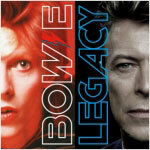 All formats of DAVID BOWIE - LEGACY are available for pre-ordering NOW. 2016 THE MAN WHO FELL TO EARTH 40th Anniversary Collectors' Edition, containing 4 DISCS and exclusive bonus CD, released 24th October - you can purchase NOW! 2016 THE MAN WHO FELL TO EARTH 40th Anniversary DVD and Blu-ray, released 24th October - you can purchase both the DVD and Blu-ray versions NOW! 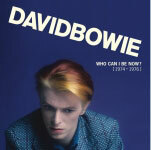 New DAVID BOWIE - 'WHO CAN I BE NOW? (1974 - 1976)' BOX SET released 23rd September in the following formats: Vinyl LP Box Set / CD Box Set and Digital Download . Official Soundtrack Recording THE MAN WHO FELL TO EARTH 2-CD audio released via Universal Music Company on 9th September - you can purchase NOW. Official Soundtrack Recording THE MAN WHO FELL TO EARTH 2-LP Vinyl and 2-CD Boxed Set released via Universal Music Company on 18th November - you can pre-order NOW. 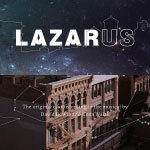 LAZARUS (Original Cast Recording) includes 3 previously unreleased David Bowie songs - released on 21st October - you can pre-order the Vinyl 3-LP and purchase the 2-CD NOW!